A refreshing dessert served with buttery biscuits. 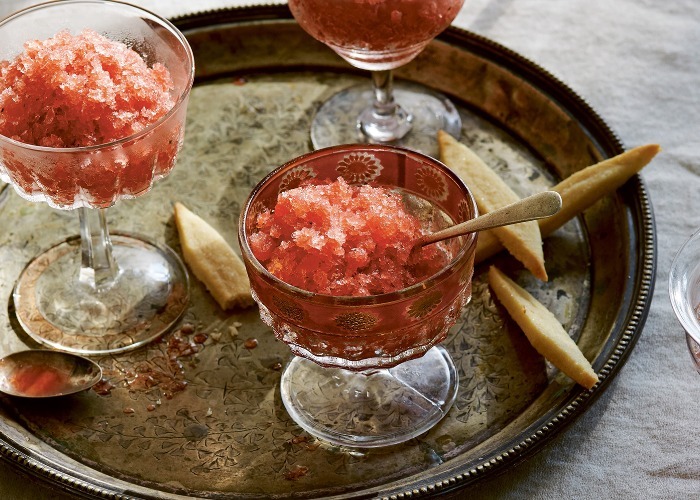 This granita is great served in old fashioned champagne glasses and you could even add a drizzle of prosecco on top. First, make the granita. In a food processor, blend together the watermelon pulp, pomegranate seeds, lime zest and juice, and mint leaves until smooth. Pass through a sieve lined with a muslin cloth to get rid of all the seeds and residue. Pour into a small baking tray, cover with clingfilm and put in the freezer for 2–3 hours. Remove from the freezer and scrape the granita with a fork, working from the more frozen edges to the less frozen middle. Re-cover with clingfilm and return to the freezer for a further 2–3 hours. Repeat 3–4 times until the entire tray turns into a frozen-solid crumble. To make the shortbread, cream the butter and sugar together using a stand mixer fitted with the paddle attachment (or an electric hand mixer) until pale and fluffy. Sift in the flour and mix until the mixture is firm enough to transfer to a lightly floured work surface, then lightly knead into a dough. Transfer the dough to a sheet of baking parchment and roll out to about 1cm (0.4 inch) thick. Sprinkle with sugar, then cut the dough into fingers and refrigerate for 20 minutes to firm up. While the dough is chilling, preheat the oven to 200°C/392°F/gas mark 6. Place the shortbread fingers and baking parchment onto a baking tray and bake for 20 minutes until pale golden in colour, then let them cool on a wire rack. To serve, scoop the granita into glasses and drizzle prosecco on top, if including. Add the shortbread on the side. This recipe is from Salt & Time by Alissa Timoshkina. Published by Mitchell Beazley, £25. Photography by Lizzie Mayson.